Snohomish PUD's vanadium flow battery system is housed in 20 shipping containers at a substation in Everett, Wash. The battery, manufactured by UniEnergy Technologies, uses electrolyte chemistry developed at Pacific Northwest National Laboratory. 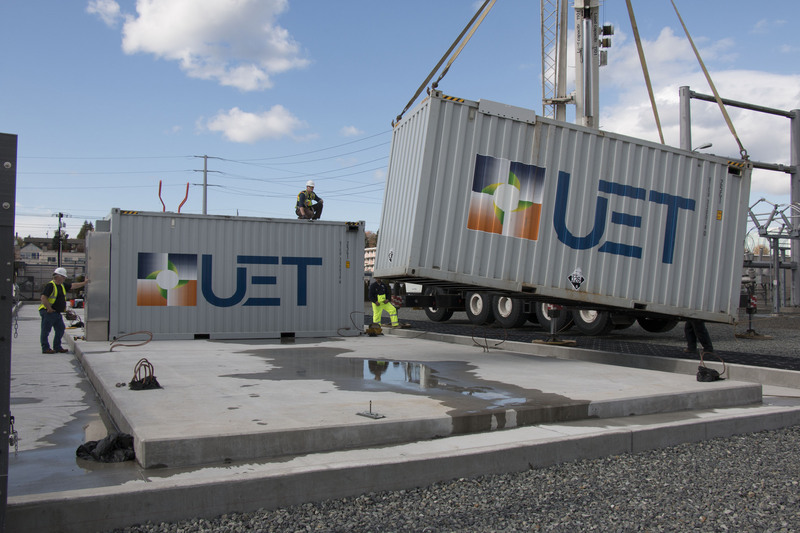 MUKILTEO, Wash. — Officials are celebrating the installation of the world's largest containerized vanadium flow battery storage system by capacity, which uses electrolyte chemistry developed at the Department of Energy's Pacific Northwest National Laboratory. Washington Gov. Jay Inslee, PNNL's Jud Virden and others are gathering today at the headquarters of UniEnergy Technologies, also known as UET, whose advanced vanadium flow battery was recently installed at a Snohomish PUD substation near Everett, Wash. The 2 megawatt/8 megawatt-hour battery was installed for one of five different energy storage projects awarded matching grants in 2014 through the state's Clean Energy Fund. PNNL is providing analytical and technical support for all the projects. PNNL developed use cases, or detailed descriptions of the many ways energy storage can increase renewable energy use and improve the efficiency and resiliency of the power grid. PNNL is also testing the performance of the battery systems and evaluating the economic impacts of the various services provided by them. For more information about PNNL's involvement, see this 2014 news release.